WordPress is the key to unlock an all-in-one package, website development, management and Content Management System (CMS). No doubt, today everything comes with a website. If you will to make one, and don’t own resources to manage the same, worry not. Outsourcing is the answer. Visualize everything you’d want in your website and narrate these to a WordPress developer. The trend is on. Take a look around, there are plenty of WordPress development centers worldwide and at very modest prices, you can get hold of them. This way, you can get your website developed as you want it to be and get the post-development management services. This leap can get the non-technical starters to take a flight adopting the online path of success. However, selecting good service providers could be challenging for when non-tech personalities. I’d be honored to fix this delusion. Give it a go and try to consider selecting the best Custom WordPress Development Service Provider in store, and customize your website suiting your market niches. References are the way to go. If you have got any chances to begin with references, you should probably proceed without any hesitation. Your friends, family, and colleagues could be the source of these references. A quality service is served in not time. Before you hire any company for Custom WordPress Development, make sure you skim through their portfolio. Choose the company based on the projects they have undertaken, similar to yours. Some companies brag about their accomplishments and promises but fail when the task is at hand. So, make it a point to go through their portfolio and get a fair clue of theirwork methods. Once you are satisfied with your website, a post-development maintenance adds a cherry to the top. The after-development support could be of a year at best. Nothing is guaranteed. In its initial stages, any website could encounter issues. In order to tackle these, a back-up is a vital promise expected from an ideal company. Read the terms and conditions of the type and medium of support as well. A market research can always do the trick effortlessly. Once you are thorough with the current market prices and the cost of the services, you are good to go. A handy tip: less prices reflect the delivery of poor quality of services and so passing over this type of company is highly recommended. Fix a decent budget and stay put. Your project’s yield hinges on the tech-dexterity of the developer. Hence, ask them to give you a clear picture on what they plan to do, whilst ruling out technical jargons, sidestepping the out-of-place feeling. Once you have ticked this to-do list, jump to your project. 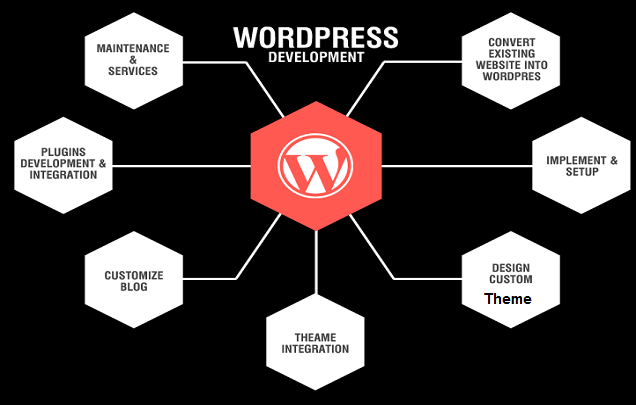 Beautify your blogs and websites after hiring any custom WordPress Development Service. Do drop in a comment if you feel I skipped on anything of paramount importance and share to assist others.